These bases are made of resin and are 3mm thick each with a different number and size of circular recesses on their ground textured upper surfaces. 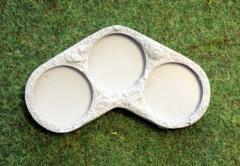 Each recess is made to fit either a 20mm round base or a 30mm round base. These are durable and rugged which makes them ideal for your troops to be mounted into on their own bases.